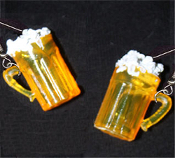 Realistic Foamy BEER MUGS EARRINGS - Sports Bar Party Jewelry - Miniature genuine-look, clear golden amber Plastic, 3-D Ale MUG charm, filled with Faux Suds. Looks like a mini version of your favorite Pub drink! Approx. 3/4" high x 1/2" diameter. Mmmmmm, BEER!